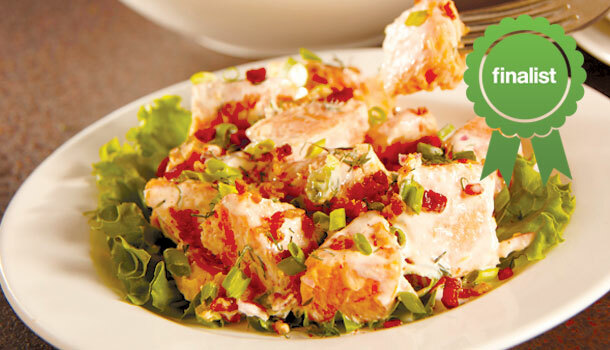 Cooking Tips: Use the additional mayonnaise mixture as a coating for fish. Rinse and scrub sweet potatoes. Peel potatoes using a peeler or small knife. Cut into cubes, and place in large pot. Add water to pot to cover the sweet potatoes (about 3/4 full). Bring water to a boil and cook for 5-10 minutes until tender. Drain and let cool completely for 30 minutes to 1 hour. While cooling sweet potatoes, chop and prepare all of the herbs and additional ingredients. Add mayonnaise to a medium bowl along with the thyme, dill, salt, 1/2 teaspoon paprika, lemon juice, 1/4 cup green onion, red onion, and 4 tablespoons bacon bits. Stir all ingredients together until well mixed. Add cooled sweet potatoes to a large bowl along with half of the mayonnaise mixture. Gently stir with a spoon, being careful to not over-mix and break apart the sweet potatoes. Add more of the mayonnaise mixture as needed for the ingredients to be well coated but not drenched. Let the sweet potato salad chill, covered, in the refrigerator for at least 1 hour, or overnight. Once chilled, gently stir once more and garnish with the additional green onion, bacon, and paprika.